Grains mixed in the overnight session with corn up slightly at ½ cent, wheat down 3 ½ cents, and beans unchanged. U.S. corn and soybean harvests were full speed ahead over the weekend and will continue until rains hit mid-week. Cattle on Feed was pegged at 105%, below the 105.6-107.4 range. Soybeans rejected recent highs after U.S. suggested there may be no new trade talks with China. Brazilian farmers have now planted 34% of their soybeans compared to the 5-year average of 18%. 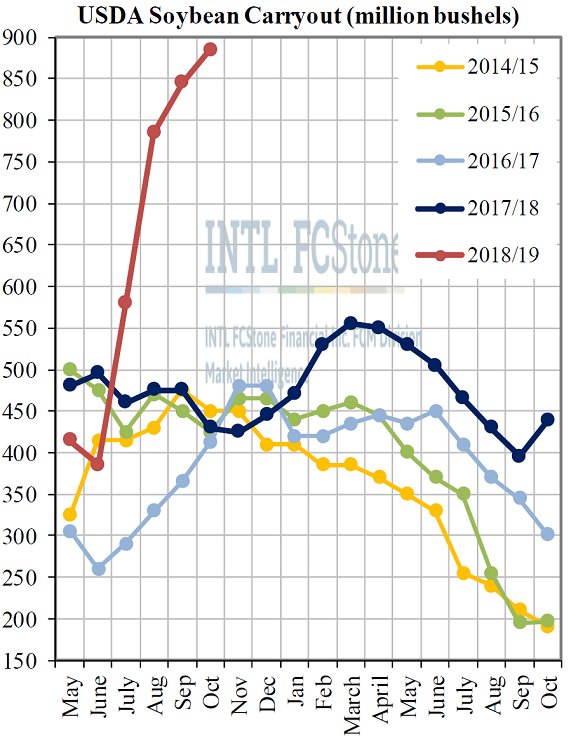 Today’s chart shows U.S. projected soybean carryout, from the start of the official new-crop S&D’s in May through the following October. The government has tacked on an even half a billion bushels to the ending stockpile since June, to an unprecedented 885 million bushels; even with no increase in yields from the current 53-bushel-per-acre area, and with the USDA already having decreased acres and more than maxed out export prospects, assumed ending stocks are current closer to the ugly billion-bushel range.